^ Thunderbolt Technology. Intel. [June 28, 2011]. ^ 2.0 2.1 2.2 Technology Brief (PDF). Intel. [February 25, 2011]. ^ Lowensohn, Josh. Intel's Thunderbolt: What you need to know (FAQ). CNet News (CBS Interactive). February 24, 2011 [February 25, 2011]. ^ Thunderbolt™ 3 – The USB-C That Does It All. 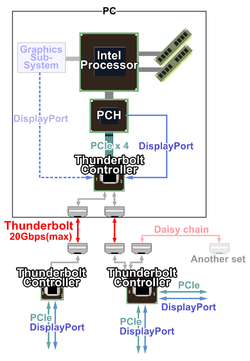 Thunderbolt Technology Community. 2015-06-02. ^ 雷雳. Apple (中国) - 官方网站. [2019-03-03] （中文（中国大陆）‎）. ^ Walton, Jarred (August 19, 2013). "ASUS Introduces Z87-Deluxe/Quad: World’s First Thunderbolt 2 Certified Motherboard". AnandTech. Retrieved December 28, 2013. ^ Torres, Edwin (January 28,2013) . MacRumors. Retrieved January 28, 2014. ^ Intel’s incredibly fast Thunderbolt 3 switches to USB-C connector. ExtremeTech. 2015-06-04 [2015-08-04]. ^ 【COMPUTEX 2015】Intel 發表Thunderbolt 3 標準，全面相容USB Type-C - TechNews 科技新報. 2015-06-03 [2015-06-04]. ^ Apple unleashes new Mac Pro – 8 times smaller, 6 Thunderbolt 2 ports, AMD graphics. [2013-06-13]. ^ Thunderbolt 3 與 U.2 配置，ASUS Z170-Premium 主機板曝光. [2015-09-18].